As you know, diamond weights are expressed in metric measurements called carats. One carat is equal to 200 milligrams, 1/5 of a gram, or 0.200 gram. A carat is pretty small: It takes 142 of them to make an ounce. The majority of diamonds used in jewelry weigh under one carat. The carat system sprouted from a carob seed. 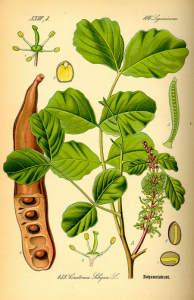 The carob seed comes from the locust tree. The seeds grow in pods that are used for flavoring and for livestock feed. Because the small seeds are fairly uniform in size and weight, they provided a fairly consistent basis for gem weight. Early gem merchants and jewelers used them as counterweights in hand-held balance scales. was standardized as 0.20 gram. The carat now stands for the same gem weight in every corner of the world. There’s an important element that you need to understand: per-carat price. It’s the figure that many wholesalers use to quote the price of single diamonds and parcels. It’s also a useful tool for comparing the prices of different diamonds. Note that these diamonds aren’t much different in size, but their total and per-carat prices are very different. Bigger is better—and costs more, right? As far as diamonds go, that’s often the case. If all other value factors are equal, a 1.50-ct. diamond is much more valuable than a 0.50-ct. diamond. But if you compare a D-Flawless, 0.51-ct. diamond and a P-I3, 1.01-ct. diamond, which one do you think is more valuable? Because of their differences in color and clarity, the smaller one is more valuable. As you’ve learned, a diamond’s value is based on a combination of the Four Cs. Even though the price of diamond increases exponentially with the carat weight, the actual size does not. The table below illustrates the typical size relationship between diamonds of increasing carat weight. Note that when carat weight triples (from 1 to 3 carats), perceived size (represented in the images below) roughly triples as well, however the diameter increases only 45% (from 6.50 to 9.40), and crown area (the surface area visible when the diamond is set) slightly more than doubles. This is important to keep in mind when reviewing diamonds of any shape; a give increase in diameter will yield a larger increase in surface (crown) area and overall perceived size. While the third diamond above has a roughly 50% greater diameter than the first, it certainly appears more than 50% larger. When viewing diamonds on Moti Kashi Diamonds, check the measurements listed for each diamond to understand its size. The length and width will tell you exactly how large the diamond will appear when viewed from above. Two 1ct. diamonds: The diamond on the left has a deep cut and appears smaller from above. Two diamonds of the same shape and carat weight may still appear different in size based on the cut proportions. A deeply cut diamond has a greater proportion of its total weight “hidden” in the depth, resulting in a smaller diameter than a well cut diamond. These differences are usually small, but noticeable. A well cut diamond may even have a slightly lower carat weight than a deeply cut diamond, yet still have a larger diameter, making it appear larger in size. Approximate size. 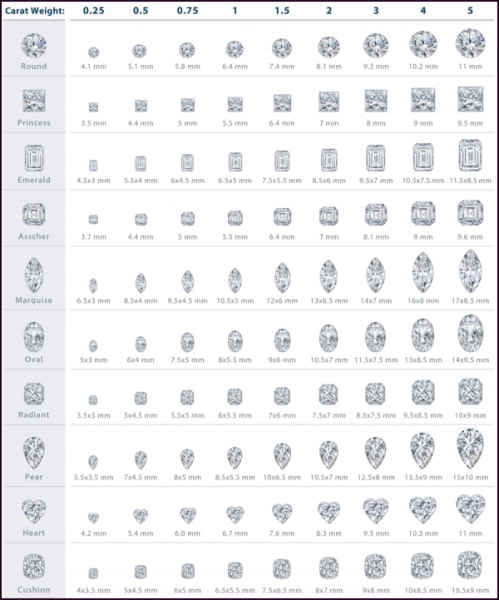 The diamond images shown are a very close approximation of the actual size of a 1 carat excellent cut for each shape. Visually, the longer shapes (oval, marquise, pear, emerald) tend to appear larger to the eye than the round and square shape. Measurements (Length x Width). The measurements correspond to the shape shown above, and are typical for excellent cut diamonds of 1 carat weight. Crown Area – The total surface area (mm2). The area gives the true size of the diamond face up (as it would appear when set in a ring). For example, while the oval diamond image appears larger than the round image, the actual surface area is the same for the two shapes, meaning the difference in size is one of perception, not reality. In contrast, the oval not only appears larger than the princess cut, it actually has a larger surface area (approximately 10% larger in this example), meaning the difference is not simply an illusion created by the elongated shape. Remember that while the measurements below are typical, every diamond is unique. If you have any questions about carat weight, ask our diamond experts at Moti Kashi Diamonds for answers.